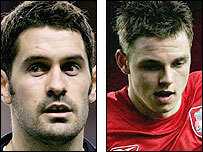 Liverpool duo Scott Carson and Paul Anderson have signed new improved contracts with the Anfield club. Carson, 20, England's third goalkeeper at the World Cup, has extended his contract by two years to pledge his future to the club until 2011. Winger Anderson, 18, part of Liverpool's FA Youth Cup-winning side last season, has extended his deal by three years - taking him to 2010. Anderson joined Liverpool from Hull in January after a successful trial. He has figured in both of Liverpool's first-team friendlies this season and scored an impressive goal against Wrexham earlier this month. Carson, who had a spell on loan at Sheffield Wednesday last season, is likely to be Jose Reina's understudy this campaign. He travelled to Germany as England back-up to Paul Robinson and David James after injury ruled Robert Green out of the World Cup.